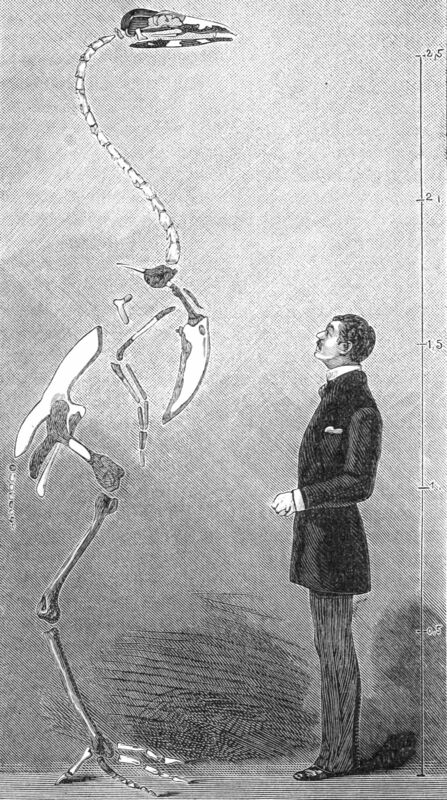 Artist’s impression of a Gastornis. 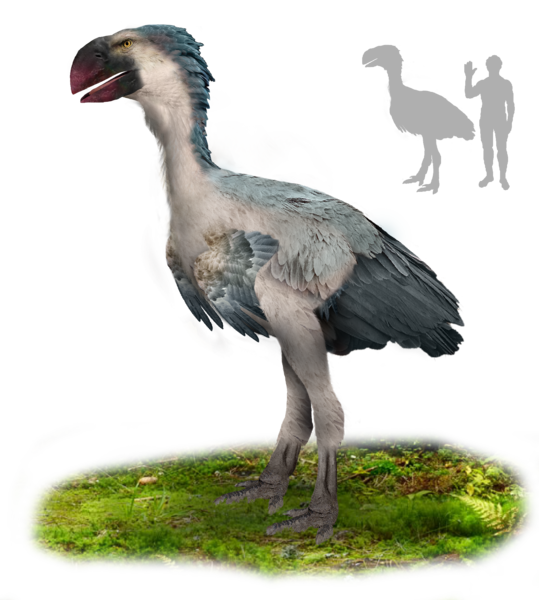 Gastornis and Diatryma are now thought to be the same species. Author: Tim Bertelink, Source: Wikimedia Commons. Was it inevitable that mammals would rule the world after the dinosaurs went extinct? The rise of mammals is often depicted as a pretty smooth transition, but in reality things were a little more complicated. In the wake of the end Cretaceous extinction birds, reptiles and mammals all began to split and diversify to exploit ecological niches left open after the dinosaurs were gone. It was a race to see who could fill more open spots on the landscape the quickest. So, in the Paleogene era, after the Cretaceous extinction, anything was possible and Diatryma is a good example of that. Lemoine’s incorrect 1881 illustration of G. eduardsii (now G. parisiensis). Source: Wikimedia Commons. Diatryma was a bird about 7 feet tall, with a massive head and beak. It lived in North America during the Paleocene and Eocene Epochs of the Paleogene era, 56 – 45 million years ago. Its fossils have been discovered in New Jersey, New Mexico and Wyoming and possible Diatryma tracks have been discovered in Washington State. Plus, paleontologists now agree that Diatryma and Gastornis, discovered in Europe, are most likely the same species, thus extending the bird’s stomping grounds to Spain, France and Germany. Diatryma/Gastornis was a widely dispersed and very successful species during a time when mammals were just beginning to diversify and fill ecological niches left open by the extinction of the dinosaurs. The Paleocene and Eocene are when the ancestors of whales, ungulates, primates and many other mammals that dominate the world today first show up in the fossil record. Paleontologists often describe Diatryma as a nightmare from the past for these mammals, a holdover from the dark days when dinosaurs ruled the earth, but I see Diatryma as a dinosaur comeback. It was competing pretty successfully with early mammals for place in the environment. And it wasn’t just Diatryma competing for bird dominance. There were large bird species in South America, North America, Europe, Africa, Asia and Australia. The infamous terror birds were the dominant predators in South America, where few large carnivorous mammals existed. Team dinosaur was going pretty strong and Diatryma was one of the larger players. But now that we’ve discussed the perilous position of mammals at the time and placed Diatryma the right context, it’s time to reveal a potentially disappointing fact about Diatryma: it was most likely an herbivore. Diatryma skeleton in our Morian Hall of Paleontology. For a long time paleontologist have argued about whether Diatryma was a carnivore or not. The size of the bird, along with its massive beak featuring attachments for large, immensely strong muscles suggested to many that this animal would ambush prey and break their necks with a powerful bite. That was always the dominant theory, but the hang up was that Diatryma lacked the hooked beak that modern birds of prey and even terror birds from the same time period possessed. They also lacked talons on their feet. For decades the carnivore status of Diatryma was questioned until finally in 2013 a study was published suggesting that the bird was most likely a plant eater. 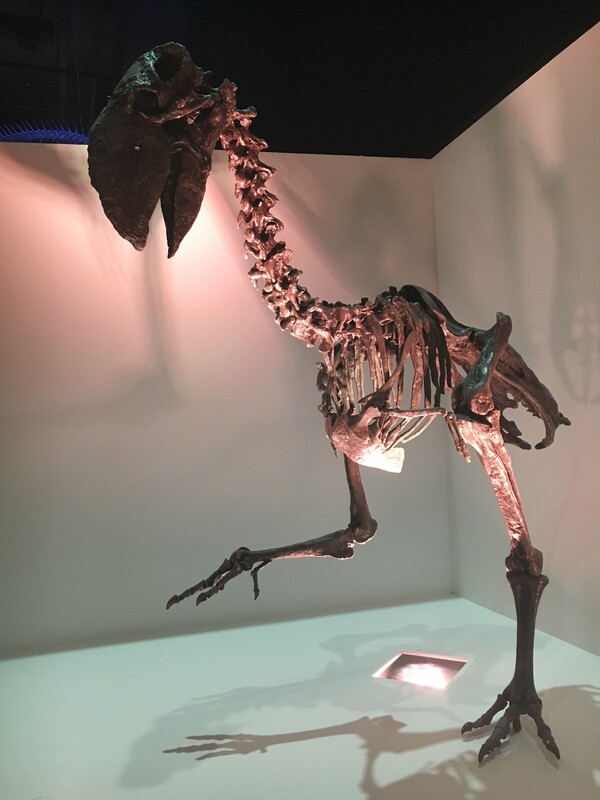 The study looked at the calcium isotope composition of preserved Gastornis (i.e. European version of Diatryma) fossils. Basically the calcium isotopic composition of bone becomes lighter the higher on the food chain you get. Levels found in Gastornis are similar to fossilized animals that are known to be herbivores. Additional studies of the levels of carbon 13 preserved in Gastornis fossils and also anatomical studies of the bird’s beak structure also suggest an herbivorous diet. Whether or not Diatryma was an herbivore, the big bird serves as a great example of how narrowly we mammals won our dominance of earth. For 200 million years our ancestors had been getting stepped on by dinosaurs and just when we thought it was safe, team dino pushed back with their numerous giant bird species that not only ate some of our ancestors, but also competed with our herbivorous ancestors for food. In the end, mammals gained the upper hand on land and now cling to the title of most successful animal group. But their success lies mostly in the fact that the largest animals in most environments are mammals. As far as sheer numbers are concerned, birds numerically outnumber mammals. So did Diatrym really represent a Cretaceous relic in the age of mammals, or did it and other large bird species roaming the earth millions of years ago represent an incursion from a group that was already taming the frontier of the sky, and almost took the land as well?